Home roulette. How to get one? Have you ever thought that you can make the roulette table at home? Home roulette can sound like fun but at the same time it is a doable thing. There are two option how you can have a roulette game at home. You need to follow the following steps carefully and not to mess up anything. 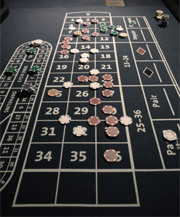 Go to a store or to an online store, which sells the roulette equipment and buy a roulette layout and wheel. The layout can and should be 36 x 72 inches. You can buy any size of the wheel you like and any quality too. Take the layout and put it on the clean and hard floor facing the floor. Then take the table and put it on the layout facing the layout. Staple the edges of the layout to the edges and the back sides of the table. Try to staple everything in the way that no staple will be on the face of the layout, as it will harden the game and will not look nice. Remember you bought the wheel? So, now it is time to use it. Take the wheel and attach it to the table on the side, where there is no layout. If your wheel is wooden, so you might like to choose the wood glue. If it is plastic, you better take epoxy. If you do not want to attach the wheel to the table, it can slide and fall, which will cause the biases in it. So, it is better to find the surface, where it will look the best and fit the best. There is another option too. You can actually build the real table all by yourself. You can take a couple of days to do it on your own, or gather your friends to have a good pastime, enjoy and relax.